Learn the symbolism of Joseph as a type of future multi-colored Israel sent to a foreign land… the “rest of the story” about the day his brothers sold him into slavery and caused their father to believe that he was dead and its correlation with Yom Kippur! Find out the secret of who Tamar really is and how we see a hidden glimpse of the future High Priest through her lineage! Vayeshev (וַיֵּשֶׁב‎) — Hebrew for “and he lived,” it the first word of the parashah and is the ninth weekly Torah portion (פָּרָשָׁה‎, parashah) in the annual cycle of Torah readings. 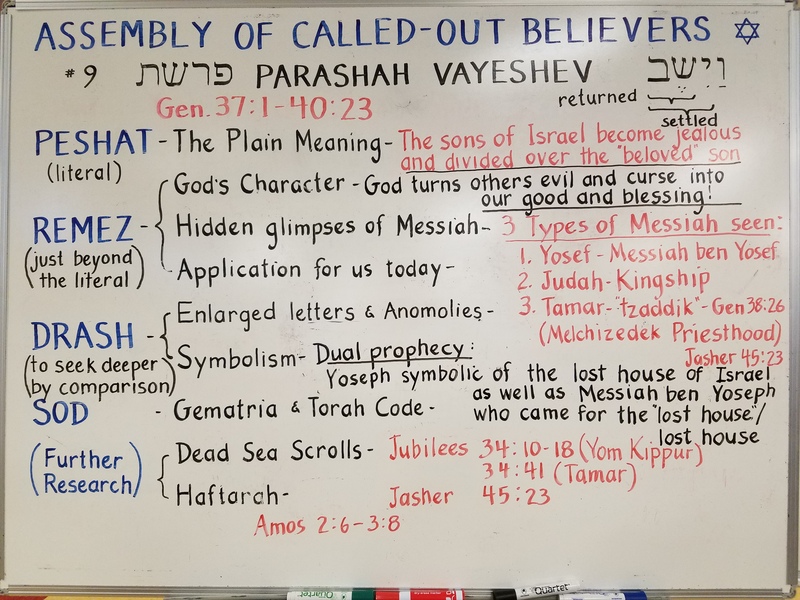 The parashah covers Genesis 37:1–40:23. Jacob settles in Hebron with his twelve sons. His favorite is seventeen-year-old Joseph, whose brothers are jealous of the preferential treatment he receives from his father, such as a precious many-colored coat that Jacob makes for Joseph. Joseph relates to his brothers two of his dreams which foretell that he is destined to rule over them, increasing their envy and hatred towards him. Judah marries and has three children. The eldest, Er, dies young and childless, and his wife, Tamar, is given in levirate marriage to the second son, Onan. Onan sins by spilling his seed, and he too meets an early death. Judah is reluctant to have his third son marry her. Determined to have a child from Judah’s family, Tamardisguises herself as a prostitute and seduces Judah himself. Judah hears that his daughter-in-law has become pregnant and orders her executed for harlotry, but when Tamar produces some personal effects he left with her as a pledge for payment, he publicly admits that he is the father. Tamar gives birth to twin sons, Peretz (an ancestor of King David) and Zerach. Amos opens with a rebuke to the Jewish People. God had been patient with them notwithstanding their transgression of the three cardinal sins — sexual impropriety, idolatry and murder. Their fourth sin, however, crossed the line — the mistreatment of the innocent, widows, orphans and the poor… in essence not taking care of the “whole house of Israel”! As opposed to other nations to whom God does not pay close attention, God’s love for His nation causes Him to experience the more immediate cause and effect of their erroneous ways to teach them, to cleanse them and prod them back onto the path of the just.